Ambulance response times were delayed in London overnight after technical problems hit the control room, the ambulance service has said. It is understood the computer system crashed, so calls had to be recorded by pen and paper for nearly five hours on one of the busiest nights of the year. A spokesman said staff were trained for such situations and continued to prioritise responses as usual. A patients' group said the breakdown was "extremely worrying". Calls had to be logged manually between 00:30 GMT and 05:15 GMT. The shutdown meant the real-time, web-based mapping of ambulance crews failed too, forcing staff to rely on radio communications only. It also meant paramedics had to manually input locations into their satellite navigation systems. London Ambulance Service (LAS) said an investigation would take place. It said it did not yet have figures for the number of calls that were affected, but its call handlers answered hundreds more calls than usual at this time of year. Malcolm Alexander of the Patients' Forum for the LAS said: "We want to know why it is that this system that cost so much money and is supposed to be so effective is not fail-safe." He added: "If this system fails at a time when there is huge pressure in the system, for example if there was a major disaster or a terrorist attack, we are going to be in trouble. We really need to make sure it doesn't collapse again." Image caption New Year's Eve was predicted to be London Ambulance Service's "busiest night ever"
Stephanie Thomas, spokeswoman for the public service union Unison said the ambulance service's highly trained staff were prepared for such occasions. "They worked hard under extreme pressure to deliver a first class service to members of the public when they were most in need," she said. One former LAS paramedic, who had been working at a private party, told the BBC there had been waits of an hour for ambulances. "We had several people who were unconscious through alcohol and needed further support from London Ambulance Service. "We needed two ambulances and it took an hour for them to arrive. Everyone was OK in the end because they didn't have life-threatening problems." He said the call handlers were "amazingly helpful", but it was "easy to become overwhelmed especially in the midst of high call volumes". The problems came as tens of thousands of people gathered to see in the new year at London's annual fireworks display, on what was predicted to be the service's busiest night ever. 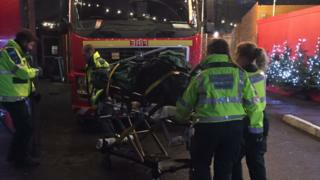 London Ambulance Service tweeted it had treated 162 patients in the event area. Staff were at nine treatment centres across the city throughout the night to look after people who had too much to drink. The LAS is the busiest ambulance service in the UK, responding to more than 1.9 million calls a year from 70 ambulance stations and support centres. In November 2015, it became the first NHS trust to be put into special measures after inspectors cited "poor performance". The UK's police presence has been stepped up amid security fears following a series of terror attacks around Europe in the past year. Have you been affected by the fault? Tell us about your experiences by emailing haveyoursay@bbc.co.uk.